When you type your keywords into the search box, Fast Blog Finder automatically suggests you keyword phrases based on your keywords. You can review a list of suggestions and select any keyword phrase from the menu. Sounds great, doesn't it? If none keyword phrase suits you, type in your own search query and click Start. To disable keywords suggestions, just uncheck the "Provide query suggestions" option. If you export a list of blogs to a .htm file, the links are shown as live hyperlinks in the .htm file. You can just click on a link and open the blog in a browser. 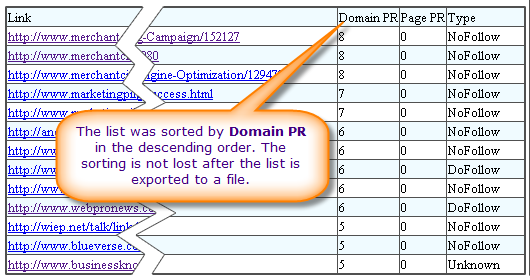 If the list was sorted in some way, for example, by the Domain PR, the sorting is not lost after exporting the current list into a file. The "Most Recent Post Date" column is renamed to "Last Updated". This column shows the date when the blog was last updated. For example, the date when the last post was added to the blog is 2008-12-10. But the last update on the blog (post edited, deleted, or etc.) happened on 2009-01-20. Thus, the program will show the last update date 2009-01-20 in the Last Updated column. 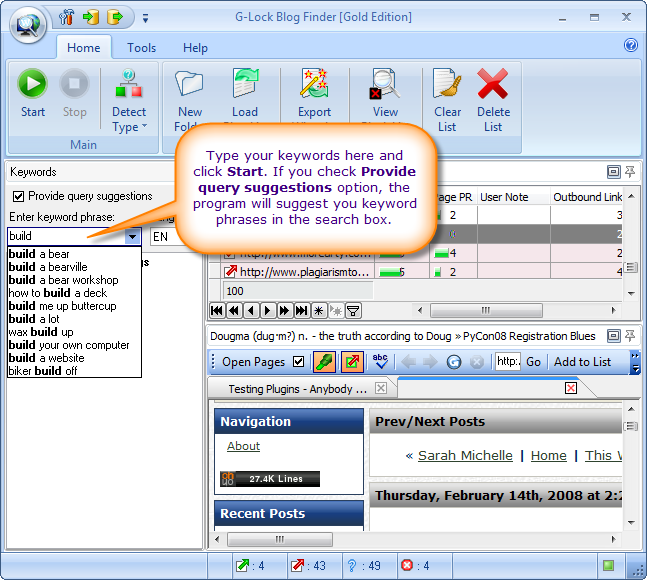 Fast Blog Finder v3 Released!.